I was doing very well with my self-imposed spending ban/restricted budgeting for the month, when I spotted this bargain over at Buyapowa. I purchased it straight away for my mum, as I knew she'd love it for Mother's Day (buying stuff for other people doesn't count right? ), being a Burts Bees fan like myself. Then I checked my Paypal account, saw that I still had some surplus funds in there, and bought one for myself. Did I need this? Erm....no. Did I want it because it was a bargain that I couldn't refuse? Yes! 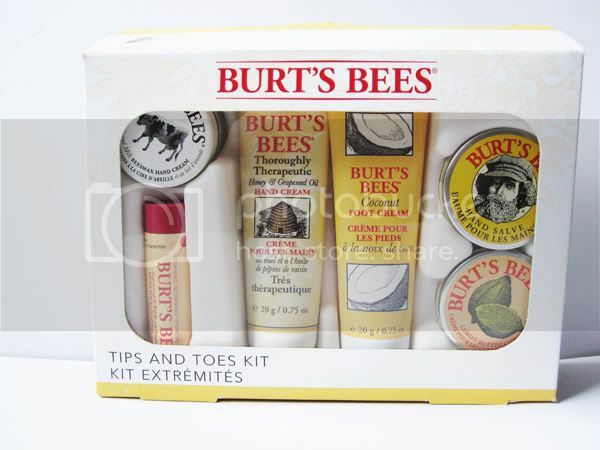 So for the grand sum of around £7 plus postage, I bought myself the Burts Bees Tips And Toes Kit, which consists of travel size/try me versions of some of their bestselling products. You get all of these: Almond Milk Beeswax Hand Cream, Thoroughly Therapeutic Honey & Grapeseed Oil Hand Cream, Coconut Foot Cream, Hand Salve, Lemon Butter Cuticle Cream, and a full size Replenishing Pomegranate Lip Balm. Seeing that the lip balm alone is nearly £4, I thought this was a great bargain and I've wanted to try out some more products from Burts Bees for ages but never gotten around to picking anything other than the lip balms up. I'll put up some mini reviews of the products once I've tried them out, so you'll probably see them in some upcoming empties posts. Have you tried any of these from Burts Bees? love burts bees especially the banana hand cream smells lush! Awww I love Buyapowa, must have missed this offer. For £7 it's amazing! I'll be very interested to hear how the pomegranate lip balm goes down! Oops read this on my phone so didnt see the buyapowa bit..great bargain! 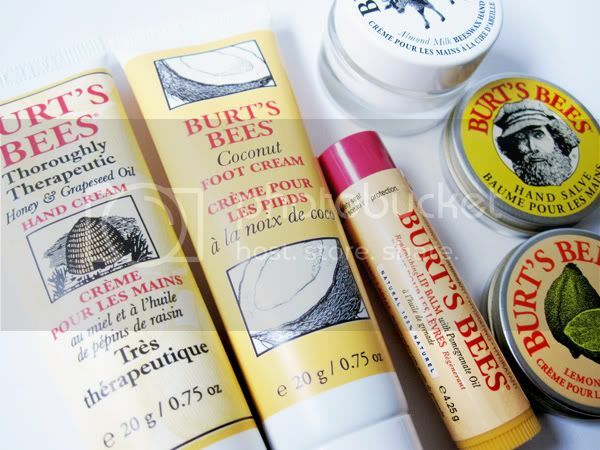 Burts Bees is such a great brand.I love so many of the products from this range. Great deal! I love most things by Burt's Bees. I put the lip gloss in my 3 daughters (ages 21, 22, 23 ) stockings last year for Christmas! I have this set, it's so good! I can't fault any product in the kit, the lemon cuticle cream is amazing and yummy! Yeah, I recently bought myself a tin too. Can be found here http://laradivine.blogspot.com/2012/03/ross-haul-picture-heavy.html#comment-form if you would like to take a look lol.. I don't like how the body lotion smells much and not a fan of the pomegranate lip balm either but I'm anxious to try their tinted lip balms. I have yet to try their cuticle cream.